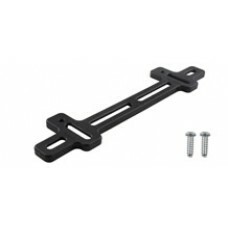 The mounting bracket provides the same features as the mounting plate, but with a smaller footprint. It is ideal for vehicles with contoured bumpers, mounting license plates to a trailer, or adding an additional novelty plate to any vehicle. This also serves as a spacer bar for recessed license plate area on rear of vehicles and replaces factory front bracket if it doesn't work ideally with license frames. It's ideal for new vehicles with contoured bumpers. Mounts license plate to any trailer. Mounts an additional novelty plate to any vehicle. Serves as a spacer bar for recessed license plate area on rear of vehicles. Replaces factory front bracket if it doesn't work ideally with license frames.